Debra joined the Delaware Chapter of the National Multiple Sclerosis Society in March, 2008 where she served to provide programs and services to over 1,500 Delawareans and their families who are living with the challenges of MS. Debra is currently the Director of Programs and Delaware Advocacy for the Greater Delaware Valley Chapter which encompasses all of Delaware, southern New Jersey and southeastern Pennsylvania – a territory serving about 15,000 clients. Debra is also responsible for all monitoring and getting involved in Delaware advocacy initiatives on behalf of the Society. Prior to joining the National MS Society Debra lived abroad for a year and a half where she interned for a social service agency providing daily living skills to adults with developmental disabilities and support services to their caregivers. Debra serves on the State Council for Persons with Disabilities (SCPD), the SCPD Policy and Law Subcommittee, the Adult Issues Subcommittee of the Delaware Developmental Disabilities Council, the Governor’s Advisory Council for Aging and Adults with Physical Disabilities, and chairs the Advocacy Subcommittee of that group. 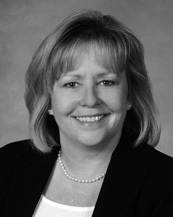 She is also a member of the Delaware Health Care Network and the Delaware Telehealth Coalition.